According to researchers at Bowling Green State University, members of the so-called Baby Boomer generation, those individuals born between 1946 and 1964, are increasingly choosing late in life divorces. Although the divorce rate in the United States has remained fairly steady at 50 percent, the number of Baby Boomer divorces has reportedly risen steadily from one in 10 in 1990 to one in four in 2009. Although divorcing can have a dramatic impact on anyone’s finances, ensuring your financial interests are fully protected when a marriage ends is especially important for older Americans who are nearing retirement. Before you begin the divorce process, you should create a financial plan that takes into account both your long and short-term financial goals. By doing so, you have the ability to go into mediation or other settlement negotiations with a better understanding of your financial needs at retirement. You should also consider your retirement budget and compare it against the cost of maintaining your current lifestyle. By examining your financial needs prior to divorcing, you can better evaluate your property settlement goals. Additionally, whether you have been out of the workforce for an extended period of time may impact whether you receive spousal support payments or a larger share of the marital assets. No matter your age, you should ensure that all of the marital assets are protected once the divorce process is initiated. It is important to ensure an angry former spouse cannot empty a couple’s bank accounts, remove items from safety deposit boxes, take out loans against marital assets, or sell the couple’s home before the divorce is finalized. If you are concerned about the possibility of such behavior, you should ask your financial institution to notify you immediately if any large withdrawals are made and file a notice in your real estate records to alert would-be buyers to the fact that the property is part of a pending divorce settlement. Normally, both spouses are entitled to half of each marital asset or financial account in California. Still, taking half of everything may not be the best decision for either party. Older couples tend to have acquired more wealth across a variety of areas and trade-offs are often made. For example, one spouse may want to retain the marital home in exchange for another spouse getting more cash or other assets. You must carefully consider the implications of such decisions, however, as an asset such as a home may not appreciate as expected and may also be quite costly to maintain. Unfortunately, splitting a couple’s assets not long before retirement can be complicated as not all assets are created equal. Divorcing can also create unintended tax and retirement consequences. Additionally, too many divorcees don’t know where to begin when negotiating a property settlement agreement. A qualified California family law attorney can help you protect your financial and other interests during a divorce. If you are facing divorce or another stressful family law matter in Southern California, call Doppelt and Forney, APLC toll-free at (800) ROY IS IT (769-4748) today. 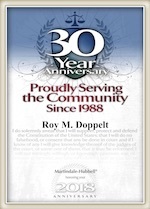 Mr. Doppelt is a capable Linda Vista divorce lawyer with more than 20 years of experience guiding clients through the often contentious dissolution process. Mr. Doppelt is available to help you with all of your divorce, alimony, child custody, child support, adoption, and other family law needs. Doppelt and Forney, APLC represents clients located in Encinitas, Scripps Ranch, San Diego, Linda Vista, and throughout Southern California. To schedule a free confidential consultation with a dedicated divorce lawyer, contact Doppelt and Forney, APLC through the law firm’s website.